If we're all truthful, most of us would admit to having pushed and pulled not only our faces, but our thighs and waist and neck, to see if we'd look better with a little nip and tuck. Especially us older gals! Now, I'm so very tired of cosmetic and makeup companies using 11-year old girls to showcase their products. If you want to convince us your products will benefit our skin and looks, prove it to us by using someone with a little mileage on her face, and let us see that she's benefitted from using your product. Most of us, however, cannot afford (and certainly should not go into debt for) a facelift, but wouldn't mind looking a little less stressed, or a little less older. There is a way, apparently. 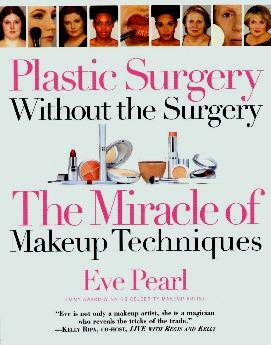 Makeup artist Eve Pearl, shows us how we can avoid the surgeon's blade and skillfully use makeup to enhance our looks. She begins with our skin - finding out your skin type - very important to know so you can manage it. Then there are tricks to cover up freckles, blotches, and marks with makeup, by blending and contouring. The pictures are amazing! And, thankfully, the "models" are not all teenagers. Eve and her mother are also featured. There are "Eve's Tips" throughout the book which include alternate remedies. Eyes, nose, double chin, circles under the eyes, whatever, Eve covers (literally) them all with subtle tricks of her trade. Now we can try them out too - much cheaper and virtually risk-free compared to plastic surgery - and with practice, we can also look refreshed and boost our self-confidence. Look at the section on cleavage! Now we know all the "Hollywood" makeup secrets, we can try and improve our own canvases. Fun. Conclusion - No woman concerned about her looks should be without this useful book.